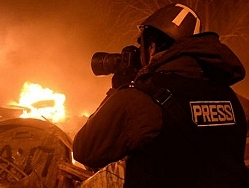 EBU urges UN to help protect journalists. Geneva, September 2016: Ahead of the United Nations General Assembly, the EBU has published a declaration urging the UN to appoint a Special Representative dedicated to protecting the safety of journalists. The declaration has been signed by the entire EBU Executive Board and reaffirms the support offered by the EBU to the Reporters Without Borders (RSF) campaign to help protect journalists worldwide. We believe the United Nations needs to take action and appoint a Special Representative with responsibility for enforcing international law and ensuring crimes against journalists do not go unpunished. There has been a failure to reduce the frequency and scale of targeted violence against journalist throughout the world and we believe that only a Special Representative with the political weight, legitimacy and capacity for rapid action can help drive change worldwide.